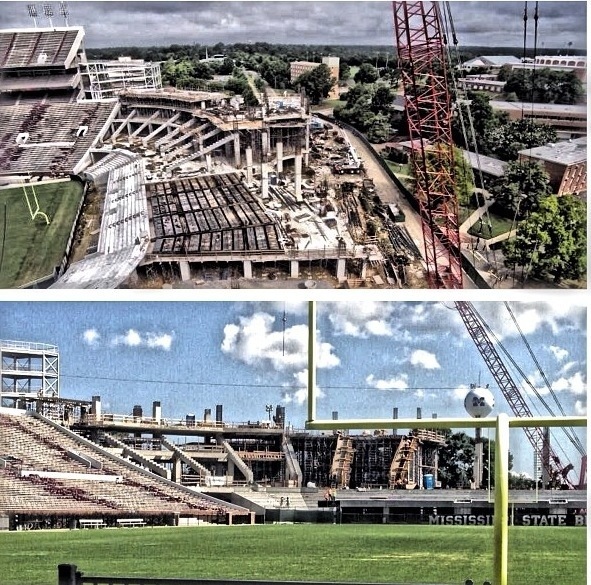 I was reminded how big the Davis Wade Stadium expansion is when Jameon Lewis shared the picture from his Instagram. The field view angle is the one that excites me the most. Not only does the size of DWS increase, but the style of the stadium finally enters the modern age of college football venues. I’m not intending this article to be a Larry Templeton shot but in my opinion, the biggest blunder on his watch was electing to expand an upper deck instead of bowling in the stadium. For years MSU has been the only stadium in the SEC that wasn’t bowled in on at least one side. Don’t think for a second that this wasn’t used at nauseam by opposing coaches on the recruiting trail. MSU fans are already aware of the atmosphere on game day but if you’d never been and knew it was the only open ended stadium, you may form a misconception. This constantly comes up in recruiting visit interviews that they were surprised by the atmosphere and crowd. This move will help squash that misconception before it even occurs. Part of getting great coaches and players is top notch facilities. With the completion of the Leo Seal Jr. Football Complex and the ongoing expansion and renovations at DWS, MSU shows its commitment to being a consistent winner in the SEC. Every February fans like to prognosticate which signees will see the field in the upcoming season. Then the players get to school and reality sets in. The reality that SEC football is on another stratosphere from high school and they may not be as game ready as they thought. These revelations culminate in the crux of the issue: should they redshirt? This is a multi-faceted issue that Coach Dan Mullen has to approach with a sense of uniqueness to MSU. You may wonder what I mean by that. A school like Alabama or Ohio State may have a bit more leverage in asking players to redshirt. They recruit in the top 5 every year and are loaded with 4 and 5 star talent. A player going to these schools know they may have an NFL guy in front of them. MSU doesn’t sign as many high profile guys and its led me to a slightly different opinion than the majority of Bulldog fans. One thing I constantly hear is that Mullen should redshirt everyone he can. I hear that if these true freshmen players aren’t on the 2 deep and don’t redshirt, its a wasted year. I vehemently disagree with this sentiment. Before I give you reason why I want to preface that there are certain positions that need to redshirt the majority of the time and they are QB and OL. Those 2 positions just need the extra year of development. The rest, not so much. Reason number 1 is that I don’t want Mullen to have the reputation that he doesn’t play true freshmen. Regardless if its a ridiculous thought, you don’t want that perception used against you on the recruiting trail. The truth is that leading up to National Signing Day, all recruits think they can play/start immediately. You have to understand that they are operating under ego-driven, over-inflated feeling of self worth and the program needs to exude the perception that they can achieve their immediate goal. That is, until fall camp and they come to the realization of the intense competition. The more true freshman that Mullen plays, the better for this perception. Next reason is that they can plain help you win games. One place I love to see young, elite talent is special teams. So many games are won or lost on coverage units and that is where a young guy, no matter how raw, can excel. Lets use an example. You sign a 4 star, 6’1 and 215lb RB who runs a 4.45. He is your 4th string RB but is a running and hitting machine. Plug him in on punt and kick off coverages. The flip side is that you redshirt him and put a 2nd string, 4th year JR safety who is not an elite athlete on the coverage units and he can’t make the plays the true freshman could. That can lose you games ladies and gentlemen. The last reason I’m pro play true freshmen is numbers. You only get 85 scholarships and can sign 25. If you redshirt everyone, that’s 125 players in a 5 year cycle. That puts you 40 players over. That’s means you need 8 players worth of attrition a year. So you can root for discipline problems to get booted, injuries, or cutting guys if you support redshirting them all. I admit that’s a little extreme but hopefully you get the point: playing more true freshmen is actually necessary. Now I want to break down the 2013 signees and what I think about there playing chances. MSU currently has 3 really good DE’s in Autry, Smith, and Brown. All are SEC starters. Mullen could get away with redshirting Jones. Let me be clear: Chris a Jones has to play. You don’t sign the 2nd best player in America to redshirt. You’d get hammered with that on the recruiting trail. You rotate him in and let him get most the reps in big wins. Maybe make him a 3rd down specialist. He actually walks into a really good situation with all the experience MSU lost from last year. A big time 4 star WR should be able to earn reps from the start. WR is a position where an impact can be made immediately and Ross should do just that. In a slightly controversial opinion, I think he should play (if ready of course). Although MSU has 4 RB’s, he could be great on coverage units. If Shumpert can help win games by playing on special teams, he should. The goal is winning now, not 4 years from now. Also think about RB. It’s not out of the blue to have an injury or 2 as the year goes on (LSU last year). Wouldn’t you feel better if he was making plays on ST all year if he gets forced into late action? There is always at least 1 guy who you think is a redshirt who plays, like Ryan Brown last year. I expect at least 1 but probably more guys to play out of the group: Shelby Christy, De’Runnya Wilson, BJ Hammond, Tolando Cleveland, Kivon Coman, or Gabe Myles. Playing too many freshmen is never good but Mullen is at a point where his depth lets him pick and choose his spots. I say take those spots and play aggressively, play to win, and use as many true freshmen that can help you achieve that. I’ve heard that the coaches give the players an honest evaluation of where they stand post fall camp and ultimately the players make the call to redshirt or not. So it’s not a 100% exclusive coaching decision. I just think there is plenty of benefit of getting more guys ready to play and not sit out a year. Good stuff from Road Warriors Radio blog and the boss Ryne Hancock. Good to see an MSU QB crack his list. Even though there are some good ones on this list, it shows how much better QB play has gotten from 2000 on. In my position by position breakdowns I listed where I thought each player was on the depth chart. This is what I had in an easy to read format. These are all my opinion and up for debate. I’m basing my opinions on attending spring practices/scrimmages, what I’ve read, and what I’ve heard. I continue my position group breakdowns with offensive line. For all intents and purposes, this is his 3rd year as the starting LT. 1rs year he took his lumps, last year fans saw much better pass blocking, and this year another step in the right direction would make Clausell a pretty dang good LT. Physically he looks to have gained a lot of size (up to 6’7 310) and strengths since year 1. That should help with his run blocking which is probably his weakness along with a bull rush. No question that he is the most elite talent on this years team. Most NFL projections have him as the 2nd best OG in the next draft. He is the only true mauler on MSU’s line. At 6’4 320 he’s got the size and also the freakish strength to go down as one of MSU’s all-time great on the OL. Just as Clausell was, Day was thrust into a starting role as a RS freshman. You might as well say he is a 3rd year starter as well. At 6’4 295, Day is the prototypical center in today’s game. He was a surprise to fans at first and has improved each step of the way. He really embraced a leadership role in the spring. Look for some sort of honors by years end for Day. As a RS freshman getting most of the reps, fans saw some growing pains. All in all, I think Malone did an outstanding job. He did really well in pass protection. There was a noticeable difference in the running game when Tobias Smith was in but that is an area he can improve in. Malone is one of the most athletic OG in the SEC at 6’6 315. The behemoth (6’7 315) juco transfer played well in his first year as a starter. One little know fact is that Siddoway played with a torn tendon in both feet for most of the year. A 100% healthy Siddoway and a full year to adjust is bound to be improved in 2013. The young Senior saw most of the 2nd team LT reps in the spring. It looks as if he’s being groomed to be the next LT after Clausell graduates. At 6’5 300, he has the size and he also has good feet. The former walk-on is one of my favorites to watch because he gives full effort every time. At 6’3 305, he’s got the size the play inside. Also has a bit of a mean streak. Probably the 3rd OG off the bench. The juco transfer is a bit undersized (6’1 295) but is a good back up option. He’s a really sound blocker and equally hard worker. Center also has to be able to call blocking audibles and he seems to be able to do this as well. At 6’5 295, he has more of a OT frame but I’ve read that he would be moved to OG. That may be a depth situation where he’s needed more at OG. Muniz is a long guy with good feet. His biggest drawback is that he hasn’t been healthy but that isn’t his fault. The former 4 star recruit took some time to adjust to big time football but he’s coming off his best spring. He almost beat out Siddoway at RT. Robinson has great size (6’6 310) and really long arms making a perfect OT frame. After a redshirt year, Carter did grow a good bit (6’5 295). He has a lot more growing he could do and good feet. A lot of upside here. Even though he’s listed as a OT, I think he’s more of a G. At 6’3 280, he could grow some more but he has a really good athletic frame. Really hard worker. He looked really good in the spring for a young guy. At 6’3 300, he has more room to grow. He plays with a mean streak. Even though I have him listed as the #3 C, he would see the field faster than some in front of him in certain situations. I could see him forced into action at G.
The first year player from Jackson Academy has been spoken well of from summer workouts so far. Plenty of upside but I expect him to redshirt. The former 4 star recruit spent a year learning to get better. Big guy at 6’5 300, he has the frame to get bigger. I don’t see him getting much playing time this year but the future is bright. Most likely a redshirt but fans were very excited about his signing. The Hollandale-Simmons product is very athletic. Pair that with a 6’4.5 and 295 frame, and its easy to see why many prognosticators thought he had the most upside of any MS Hugh school OL. How often do teams get to say they return all 5 starters? It’s not often but MSU can. Throw in the wildcard that Tobias Smith hasn’t completely written off returning yet and the potential for the line this year is big. There is also quality depth to bolster the first 5. Another thing to notice about Mullen’s OL recruiting is that he likes big, long, athletic guys and the roster shows that. Also notice that there aren’t any fat boys either. These guys can move. I continue the breakdowns today with safety. The senior head hunter has played his whole career at FS and that’s where I expect he’ll start. After standout years as a freshman and sophomore, last year was a bit of a down year production wise. It’s understandable considering he was coming off a ruptured Achilles. In the spring, Whitley looked better conditioned and was moving well. He looked like the old Nickoe. That’s good news for MSU fans who covet that enforcer at safety. Even though this is Hughes first year as the full time starter, he probably should have started last year. It would have been hard not to start Corey Broomfield last year, even though he was out of position. The 5’11 190 Hughes plays like a coach on the field. He always seems to be in the right place to either make a play on the ball or the receiver. He had a really good spring and I’d expect the same in fall camp. Big upgrade at the position, personnel wise, as opposed to last year. The 5’10 195 product of Mccomb really came into his own since the end of last year. He’s really established himself a the FS of the future and probably earned game reps on defense and special teams. He’s a really good athlete who does everything pretty well. He also packs a punch when he gets to the ball or receiver. By far the most physically imposing safety on MSU’s roster at 6’1 210. He had a neck and neck battle with Hughes and Hughes barely edged him out in my eyes. Physically and athletically I think Arrington is superior. He constantly wows you in practice with his athleticism and size but probably needs to work on the mental side to overtake Hughes. I expect Arrington to get his fair share of game reps and really shine on coverage units. The South Panola product shows the same thing in practice he showed his whole high school career: a nose for the ball. He’s not gonna wow you with size (5’10 185) but he will with heart. With the MSU secondary being so packed, it will be interesting to see where he fits in as far as reps but he deserves to crack the game log. The Belle Chasse, LA native came in with the nickname of “hitman” and he has not disappointed. At 5’9 205, he’s in the similar mold of Nickoe Whitkey physically and stylistically. There is definitely a future for Antoine in the defensive backfield. He just needs to work on coverage and the mental aspect of being a safety. The 2013 signee from Bogue Chitto immediately bring something to safety that MSU lacks: size. At 6’2 175 he has a really long frame that can flourish in his time with Coach Balis. He’s classified as an athlete but I really think safety is his home. At camps last summer, he ran 4.4 range so speed is not an issue. Very bright future for Wells even though he will probably redshirt. When you think about safety last year, you really need some perspective. MSU had a FS (Whitley) that was clearly not 100% and a SS (Broomfield) who played CB his whole career and was out of position. A healthily Whitley and Jay Hughes is a big upgrade from last year. Both guys I have at #2’s are legit SEC starters so you have to feel good about quality depth. The only minor gripe i could have is lack of size. You would love to see all the guys the size of Arrington and Wells. Fortunately, being big isn’t a requirement to be a good safety. All in all, there is a lot of athleticism and safety is not a position group MSU fans should worry about. I continue my breakdowns with cornerback. 4 star juco transfer who originally signed with MSU out of West Point but had to go the juco route. At 6’2 190, he immediately fits into the bigger type of CB that Darius Slay and Jon Banks were. After watching him all spring, I’m sold on his ability. He plays extremely physical on the outside as an intimidator. He has speed to burn. Definitely an NFL type talent that has to prove it on the field. A big year and he could be 1 and done. First off, I have Jiles listed as a sophomore but he’s a freshman on 247. I think he can get last year back via a medical redshirt on the back end of his career. I’m not an MSU official so don’t hold me to that listing. Anyway, at 5’10 and 190 Jiles isn’t the physically imposing CB that Cox is but he’s just as tough. In the spring he was neck and neck with Will Redmond but the suspension propels Jiles. He’s a well rounded CB who does everything well and needs to learn through experience. The most experienced of all of MSU’s corners and the only returning one with an interception. He’s very similar in size to Jiles and ran a dead heat in the spring with Jiles and Redmond. Love is very agile and uses his quickness to jump routes. He constantly gets praise from coaches for his progress during off-season workouts. Very well could be the starter come week 1. Somewhat of the forgotten man at corner for MSU. An injury kept him from competing this spring but he does return the 2nd most experience right behind Love. At 6’1 he does have really good size. He looked good in mop up duty last year. Fall camp is going to tell it all for Calhoun and his play time this upcoming season. Having him as a 3rd team guy is not indicative of his talent or his performance in the spring. Having him 3rd team is all about him sitting out 6 games and having to get in the swing of things in the 2nd half of the year. He’s 6′ 180, runs really well, and plays with route intelligence. The suspension is no doubt a set back but I fully expect Redmond to make a strong push at playing time as soon as its up. Originally signed with MSU last year but had to do a year at Hargrave and was able to enroll in January and go through spring practice. I was actually very surprised to see him at CB and not safety but I began to see why. At 6’1 200 with long arms, he is quite the imposing corner. He is very raw but I like his future. Outside of coverage units I don’t see him getting a bunch of game reps but I really like Coman’s future in the defensive backfield. He started his career as a walk-on from juco but he has competed in the defensive backfield at safety and corner from day 1. McCaleb is a hard worker with good size (6’3 200). From watching a bunch of practices and following McCaleb on twitter, its hard for him to not be a favorite of mine. He’s a guy you just root for. All these guys turned down other major BCS offers to come play CB at MSU. All 3 bring different strengths to the table but I expect to see all redshirt considering what’s in front of them. The competition at CB the next few years will be intense. Even though MSU lost 2 big time corners in Banks and Slay, I expect this group to do a really nice job replacing them. Cox gives gives you that immediate big time talent. Love, Jiles, and Redmond are in the middle of competition that makes everyone better. Love and Calhoun return the most experience but I’m not sure how much that matters. When you look at this position group and see no scholarship seniors and 7 guys sophomore or younger, you really have to like the future. That’s dog eat dog competition that will give you some quality starters.